The InterNICHE Policy defines the concept of ‘ethically sourced’ material to encourage replacement and enhance the acquisition of knowledge, skills and attitudes. Within the fields of education and training in medicine, veterinary medicine and biological science, students and professionals have access to the wide range of non-animal alternatives that are now available. These replacement methods, usually developed by the teachers and trainers themselves, include models, manikins, mechanical simulators, multi -media software, virtual reality (VR) and student self-experimentation. For zoology and veterinary medicine, hands-on experience of living animals and of animal cadavers, organs and tissue is also necessary. Practical classes in anatomy, pathology, clinical skills and surgery training can benefit considerably from informed curriculum design that uses a combination of non-animal alternative tools and animal based alternative approaches. The humane tradition of student clinical rotations is practised widely in the training of veterinary students, but could be extended considerably. Earlier and greater access to cases in teaching hospitals, and strategic alliances with NGOs for work in shelters and communities, particularly on sterilisation projects, can provide additional valuable hands-on experience. Integrated into the curriculum, they offer authentic scenarios, with positive learning opportunities at many levels. This is in contrast to the contrived experience, involvement in harm, and exposure to the implicit negative lessons from the hidden curriculum, that are presented by animal experiments. Healthy companion animal ‘volunteers’ can be consenting subjects for non-invasive clinical skills training. They can also be subjects for ‘living anatomy’ lessons, where body painting can allow the study of movement from an anatomical perspective. The participating volunteers receive the reward of food and social interaction. Operating within the context of healing not harming, such therapeutic work with animal patients and positive interaction with volunteers can validate and encourage the practice of caring as an essential clinical skill.2 These activities can also help to replace harmful animal use in clinical skills and surgery training, by providing a direct and practical alternative. Animal cadavers, organs and tissues can be used in anatomy and pathology for dissection and for histology classes, and can be preserved with glycerine or formaldehyde, or by the process of plastination. For clinical skills and surgery, they can be used for surgical dissection and for basic and advanced skills practice. Cadavers and organs can also be ‘animated’ by applying perfusion and pulsation, providing opportunities for a wide range of procedural and trauma training.3 In addition, fresh tissue can be used in biochemistry, physiology and pharmacology practical classes. The alternative to the killing of animals for their cadavers, organs and tissues is to obtain them through ethical means. The Policy introduced and defined the concept of ‘ethically sourced’ material. The strict conditions behind the definition demonstrate how seriously animal harm, including killing, should be considered. The Policy encourages the highest ethical standards, and motivates against the perceived need to compromise. Yet it is also realistic, reflecting sustainable contemporary examples of ethical sourcing, achieved through body donation programmes at progressive veterinary colleges. Conventional sources of animal cadavers, organs and tissues include wild caught animals, research facilities, breeders, farms, slaughterhouses, zoos, sporting events, and some animal shelters. The context of instrumental use and the associated freedoms denied and harm caused, mean that any potential ethical element of the use of such sources has been compromised or negated. InterNICHE does not consider material from these sources, including so-called ‘waste’ or ‘surplus’ material, to be ethically sourced. The use of the by-products of killing done at such locations, including for practical or financial reasons, is not acceptable: slaughterhouse material, or animals killed because they are no longer wanted at the end of research or testing, would therefore not be considered replacement alternatives, according to the Policy. Waste chicken ilea taken from the slaughterhouse can indeed help end the purpose-killing of guinea-pigs whose ilea are used in pharmacology preparations, but the resource is dependent on the continued killing of the chickens. In this case, InterNICHE would instead argue for the use of existing software and the development of immersive VR-based training in such practical classes. There would also be some opportunities for the harvesting of ilea that are ethically sourced, for example from companion animal rodents. Nevertheless, some physiology and pharmacology practical classes just reflect animal experiments performed in science. As significant parts of research and testing continue to move away from animal experimentation toward a new and less-tarnished gold standard, such training at the student level — whether virtual or on real tissue — may also be abandoned. The same is true for the training of laboratory animal scientists and technicians. In the meantime, some training courses already use a range of non-animal alternatives, and in a similar vein to the above, haptic-enabled VR procedural training, along with clinical learning opportunities on animal patients, could achieve considerable replacement in these fields. Material from animals that do not commonly exist as free-living wild, stray or companion animals may be hard to source ethically. In these cases, deriving cadavers, organs and tissues from sources such as research facilities and farms is an acceptable compromise, when all the other conditions are fully met. This is known as an ‘acceptable other source’ for such material. Importantly, for the characterisation of a material as either ‘ethically sourced’ or ‘acceptable other source’, the animal must still have died naturally or in an accident, or have been euthanised for medical reasons — that is, in response to natural terminal disease or serious non-recoverable injury. The development of innovative and humane tools and approaches reflects a creativity motivated by the need to better meet teaching objectives and to harness the power of technology to support the learning process. Teachers and trainers who are responsible for curricular design and for the methods employed in practical classes, are encouraged to further implement these progressive methods. Student and trainee access to clinical learning experiences and to ethically sourced cadavers, organs and tissue, can not only help end harmful animal use, but can also demonstrate the potential for positive interactions with animals in education and training. 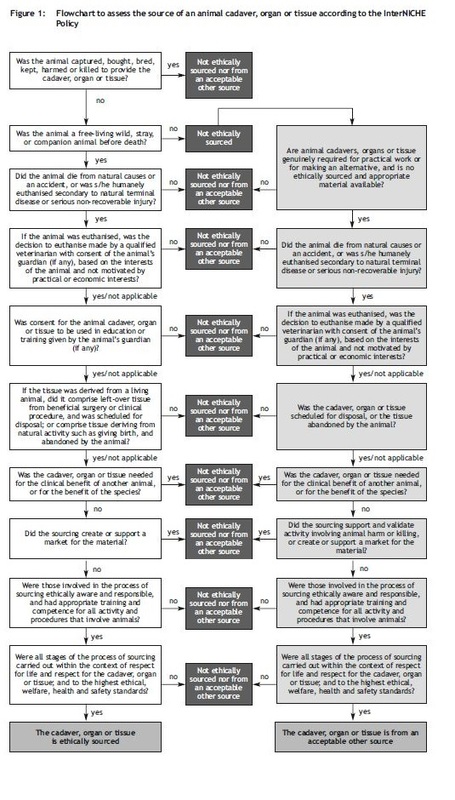 The InterNICHE Policy and the flowchart on sourcing help define the context and present the conditions for the successful implementation of both non-animal and animal-based replacement alternatives. 1 Martinsen, S. & Jukes, N. (2008). Ethically sourced animal cadavers and tissue: Considerations for education and training. AATEX 14, Special Issue, 265–268. 2 Martinsen, S. (2008). Training the animal doctor: Caring as a clinical skill. AATEX 14, Special Issue, 269–272. 3 Aboud, E., Suarez, C.E., Al-Mefty, O. & Yasargil, M.G. (2004). New alternative to animal models for surgical training. ATLA 32, Suppl. 1, 501–507. 5 Martinsen, S. & Jukes, N. (2008). From Policy to practice: Illustrating the viability of full replacement. AATEX 14, Special Issue, 249–252. 6 Jukes, N. & Chiuia, M. (2003). from Guinea Pig to Computer Mouse: Alternative Methods for a Prog ressive, Humane Education, 2nd edition, 520pp. Leicester, UK: InterNICHE. 7 Martinsen, S. & Jukes, N. (2012). An ethical scoring system for the production and assessment of alternatives in education and training. ALTEX 1/12, Proceedings of WC8, 399–404.